Arizona State will try and bounce back from its first loss of 2011, a 17-14 setback at Illinois, when they host the #23 USC Trojans at Frank Kush Field/Sun Devil Stadium, Sept. 24. The Fighting Illini stifled the Sun Devil offense, sacking Brock Osweiler six times and forcing three ASU turnovers to end the Sun Devil winning streak at four (dating back to 2010). USC enters the weekend 3-0 and 1-0 in Pac-12 play. The Trojans beat Syracuse 38-17 in the Coliseum last Saturday and earned a win in the first ever Pac-12 game when they beat Utah on September 10. It will be the first road trip of the year for USC. ON THE AIR: The IMG-Sun Devil Sports Network will carry all 12 of ASU’s football games live on their 10-station radio network, including flagship station Sports 620 KTAR AM. Tim Healey (play-by-play) and former Sun Devil quarterback Jeff Van Raaphorst (color analyst) will call the action. The USC game will air on 92.3 FM. It can also be heard on Sirius/XM radio on Sirius Channel 139. LIGHTS, CAMERA, ACTION: ESPN will televise the match-up between the Sun Devils and the Trojans. Joe Tessitore and Rod Gilmore will call the action with Shelly Smith on the sidelines. SUN DEVILS VS. TROJANS: The Trojans lead the all-time series with Arizona State 19-8, including victories in the last 11 meetings. ASU has not defeated USC since a 26-15 win in the Coliseum in 1999. USC is 9-5 at Sun Devil Stadium with five straight wins. ASU’s last home win over the Trojans was in 1997, a 35-7 Sun Devil victory. COACH ERICKSON VS. USC: Dennis Erickson is 1-8 against USC in his head coaching career. His lone victory came in 2000, when his Oregon State Beavers bested the Trojans 31-21. FIRST PAC-12 GAME: Arizona State will play its first ever Pac-12 Conference game against the USC Trojans. It is fitting that USC is the first Pac-12 opponent for the Sun Devils, as they faced USC in the first ever Pac-10 game played in Tempe. After leaving the WAC to join the Pac-10 in 1978, the Sun Devils shocked the #2 USC Trojans 20-7 at Sun Devil Stadium to earn the program’s first ever Pac-10 win. USC was led by Heisman Trophy winner Charles White and Ronnie Lott and 20 of their 22 starters that year went on to play in the NFL. RANKED TEAMS COMING TO TEMPE: This will be the second straight home game for Arizona State against a team ranked in the Top 25. USC is ranked #23 in this week’s AP Poll (the Trojans are ineligible for the USA Today Coaches Poll). The last time ASU faced ranked teams in two straight home games was in 2005, when the Sun Devils were beaten by #1 USC on October 1, then fell to #25 Oregon the next week. COACH TO CURE MD: The Arizona State coaching staff will be wearing Coach to Cure MD patches this week to raise awareness and funding for Duchenne Muscular Dystrophy research. This is the fourth consecutive season that coaching staffs throughout the country will be wearing the patches to help fight the disease. ILLINOIS RECAP: Just over halfway into the first quarter, it looked like it would be a shoot-out between Illinois and ASU, with each team having scored a touchdown. But a field goal by the Illini near the end of the first would end the scoring until the final frame, as the two defenses battled it out all night. In the end, it was Illinois who made the defensive stand when they needed to, forcing the Sun Devils into a four-and-out while holding a three point lead late in the game. Brock Osweiler was sacked six times and turned the ball over three times, including two interceptions in the 17-14 loss. The Arizona State defense forced three turnovers of their own, but a 16-yard TD strike from UI’s Nathan Scheelhaase to A.J. Jenkins with just under 10 minutes to play gave Illinois a lead that they would not relinquish. Osweiler finished with 256 passing yards, a TD pass and a TD run, but it was not enough as ASU dropped its first game of the year. PAC-12 OPENER: The Sun Devils will play their first ever Pac-12 game against USC this week. ASU played 33 seasons in the Pac-10, going 12-19-2 in Pac-10 openers. This will be the fifth straight season ASU has opened conference play at Sun Devil Stadium. All-time ASU was 8-7-1 when opening Pac-10 play at home. PFEELING THE PFLOW: Aaron Pflugrad had a night to remember against Missouri. The senior wide out tied a career-high with eight catches and set a new career-high with 180 yards. He also scored two touchdowns for the second straight week. In the three games this season, Pflugrad has totaled 18 receptions for 305 yards and four TDs. Entering the 2011 season, he had 576 yards and three touchdowns in his career. MR. VERSATILE: Jamal Miles has done a little bit of everything this 2011 season. In the opener against UC Davis, he returned a kickoff 98-yards for a touchdown. Against Missouri, he put on a touchdown clinic, catching two touchdown passes, including the game-winner in overtime, and threw a touchdown pass. It was the first touchdown pass of his career on his second career completion. RUNNING FOR MILES: Jamal Miles returned his second career kickoff for a touchdown against UC Davis, bringing it back 98 yards. It was the second consecutive game in Sun Devil Stadium Miles has returned a kick for a score, as he had a 99-yarder in last season’s home finale against UCLA. Miles joins teammate Omar Bolden, Terry Battle and Whizzer White as the only Sun Devils in school history with two career kickoff return touchdowns. It was the sixth kickoff return for touchdown the Sun Devils have had since Dennis Erickson took over as head coach in 2007, the most under one coach in school history. DEBUT DEVILS: 21 student-athletes have seen their first action at Arizona State this season: Rashad Wadood, Alex Garoutte, Anthony Jones, Kipeli Koniseti, Carl Bradford, Tyler Sulka, Kevin Ozier, Ezekiel Bishop, Josh Hubner, Jamil Douglas, Jordan McDonald, Davon Coleman, Rashad Ross, Mike Bercovici, Sil Ajawara, Kevin Ayers, Marcus Washington, Taylor Kelly, Angelo Magee, Chike Mbanefo and Gannon Conway. Wadood, Bishop and Bercovici are all true freshmen. MORE FIRSTS: Several Sun Devils recorded milestone “firsts” in the win over UC Davis. Quarterback Brock Osweiler made his first career start at Sun Devil Stadium. His previous two career starts came at Autzen Stadium against Oregon (2009) and at Arizona Stadium against the Wildcats (2010). Quarterbacks Mike Bercovici and Taylor Kelly each threw their first pass completion in their first career action. Running back Marcus Washington scored his first career touchdown in his first career game. Wide receivers Chris Coyle, Jarrid Bryant, Kevin Ozier, Angelo Magee and Rashad Ross all made their first career receptions. PAC-12 PREDICTIONS: Arizona State has been picked to finish second in the Pac-12 South in the annual media poll. Oregon, who ASU will face in Eugene on October 15, has been picked to win the Pac-12 North. The winners of the two divisions will face each other in the first ever Pac-12 Championship Game on December 2. NOEL HUDDLE OFFENSE: Offensive coordinator Noel Mazzone always says how the Sun Devils can score in a hurry, and they have not let him down this season. Arizona State’s first two touchdown drives of the UC Davis both took under 1:10. Last season, ASU had 11 scoring drives that took under 1:10. Against Missouri, ASU had an eight second scoring drive. DUAL THREAT: Cameron Marshall has a well deserved reputation as one of the top running backs in the Pac-12, but he proved against UC Davis that he is just as dangerous through the air. Marshall caught four passes for 86 yards against the Aggies, setting a new career high. His previous high was 45 yards last season against USC, but he topped that mark on his first reception of the year, a 47-yard pitch-and-catch on the first offensive play of the season. He also ran for two touchdowns in the opener. THREE AND OUT: The 2010 ASU defense was one of the top teams in the nation to force opposing offenses into three-and-out possessions. The Sun Devils averaged 4.08 three-and-outs a game, for a total of 49 in their 12 contests. That placed them in the top 20 in the nation. So far in 2011, ASU has forced opponents into nine three-and-outs. PUSH ‘EM BACK: In 2010, the Sun Devil defense routinely made tackles for loss or for no gain. The defense finished 2010 with 143 plays that went for negative or no yards, totaling 307 yards lost for the offense. Against Illinois, the Sun Devil defense totaled 10 plays of negative or no gain for the Illini, for 46 yards lost. ANOTHER DYNAMIC DEBUT: For the second straight season, a Sun Devil was named the Pac-10’s Defensive Freshman of the Year. Junior Onyeali earned the award for 2010, after teammate Vontaze Burfict took home the award in 2009. Onyeali led the Sun Devils and all Pac-10 freshmen with 6.5 sacks for a loss of 61 yards. Of his 18 stops in 2010, 11.5 were for loss. Onyeali picked up where he left off, picking up a sack and two tackles for loss in the win over UC Davis. 100-YARD DUO: Running backs Cameron Marshall and Deantre Lewis are no strangers to having big games on the ground. Lewis has three career 100-yard games, while Marshall has two of his own. Lewis also has two 100-yard receiving games. CORONA CENTENNIAL CONNECTION: The 2011 Sun Devils have seven student-athletes who played at Centennial High School in Corona, California in high school. Headlining the Centennial group is the linebacking trio of Vontaze Burfict, Brandon Magee and Shelly Lyons. Wide receiver Angelo Magee, Brandon’s brother, defensive lineman Will Sutton, quarterback Michael Eubank and wide receiver Jarrid Bryant also attended Centennial. Bryant graduated from Salisbury Prep in Connecticut, but began his high school career in Corona. ALL-ACADEMIC: Nine members of the Sun Devils were honored as Academic All-Pac-10 selections in 2010, headlined by First Teamers Steven Threet and Dean DeLeone. It was the 12th straight season that ASU has had at least one First Team selection. Joining Threet and DeLeone were honorable mention selections Grandville Taylor, Brandon Johnson, Cameron Kastl, Mike Marcisz, Aaron Pflugrad, Colin Parker and Thomas Weber. Parker also earned honorable mention in 2008, while Weber earned a selection for a fourth consecutive year. He was a First Team choice in 2007, Second Team in 2008 and honorable mention in 2009. SENIOR CLASS: The 2011 Sun Devils will feature one of the largest senior classes in the nation, as there will be 27 seniors playing in their final season. The senior class includes: Linebacker Oliver Aaron, wide receiver George Bell, offensive lineman Chris DeArmas, safety Eddie Elder, safety Clint Floyd, defensive end Jamaar Jarrett, tight end Trevor Kohl, offensive lineman Nick Emanuele, linebacker Shelly Lyons, linebacker Brandon Magee, wide receiver Angelo Magee, wide receiver Gerell Robinson, offensive lineman Brice Schwab, wide receiver Mike Willie, cornerback Omar Bolden, offensive lineman Garth Gerhart, snapper Cameron Kastl, offensive lineman Dan Knapp, offensive lineman Mike Marcisz, offensive lineman Trent Marsh, defensive lineman Bo Moos, linebacker Colin Parker, wide receiver Aaron Pflugrad, offensive lineman Aderious Simmons, wide receiver T.J. Simpson, offensive lineman Adam Tello and defensive back Austin Williams. BROCK’S TALLER THAN YOU: Quarterback Brock Osweiler checks in at six foot eight inches tall, making him the tallest quarterback in the FBS. Osweiler is one of nine QBs 6-6 or taller in the nation. SELECT COMPANY: Head Coach Dennis Erickson is in select company when it comes to conference Coach of the Year awards. Coach Erickson is one of only two coaches in the nation to have six Coach of the Year trophies to his name. Erickson won Pac-10 Coach of the Year honors in 1988 (Washington State), 2000 (Oregon State) and 2007 (Arizona State) and Big East Coach of the Year honors in 1991, 1992 and 1994 (all with Miami). The only other coach with six Coach of the Year awards is South Carolina’s Steve Spurrier. NATIONAL EXPOSURE: Four of Arizona State’s 12 regular season games have already been picked up for national television. The September 9 match-up with Missouri at Sun Devil Stadium was televised by ESPN. Last week, September 17, ASU’s game at Illinois was shown on the Big 10 Network. ESPN will air this week’s game with USC, and ESPN will show the regular season finale with California in Tempe on November 25. SPREADING THE WEALTH: Three Sun Devil quarterbacks have completed 74 this season, finding 13 different receivers. Last season, three ASU QBs combined to throw completions to 16 different receivers. ASU HALL OF FAME: Two former Sun Devil football student-athletes are members of the 2011 ASU Hall of Fame class. Adam Archuleta, who played linebacker from 1997 to 2000, and Marvel Smith, an offensive lineman from 1997 to 1999, will both be inducted at halftime of the Oregon State game on October 1. Archuleta spent seven seasons in the NFL while Smith played nine seasons. NO RANKING? 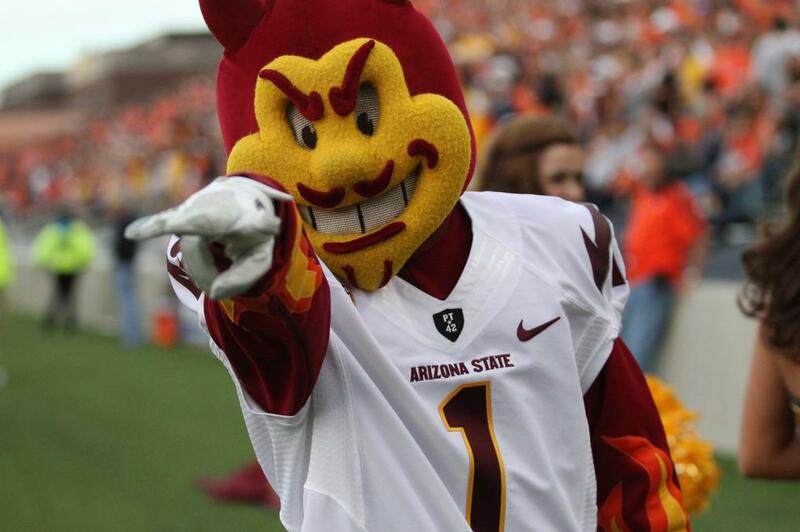 NO PROBLEM: ASU just missed being ranked in the preseason Associated Press poll announced on Aug. 20. The last three times ASU finished in the top 25 of the Associated Press poll, it was not ranked in the preseason. ASU finished 14th in 1997 (9-3 with Sun Bowl win over Iowa under Bruce Snyder), 19th in 2004 (9-3 with Sun Bowl win over Purdue under Dirk Koetter) and 16th in 2007 (10-3 with Holiday Bowl loss to Texas under 2007 Pac-10 Coach of the Year Dennis Erickson). HEALING UP: Despite suffering severe knee injuries during spring practice, both Omar Bolden and T.J. Simpson have played huge roles for the Sun Devils as they prepare for the 2011 season. Bolden has been mentoring the cornerbacks, imparting wisdom gained from his stellar career at ASU. On the other side of the ball, Simpson has been helping the wide receivers by sharing his knowledge from his time on the field. Both Bolden and Simpson continue to rehab their injuries. UNI-WATCH: Arizona State wore their traditional uniform combo for the season opener against UC Davis (gold helmet, maroon jersey, gold pants). They wore all black against Missouri and all white for the first road game at Illinois. DID YOU KNOW: This will be the fourth time in history Arizona State has opened up conference play against the USC Trojans, but the first time since 1991. The Sun Devils went 2-1 when they opened Pac-10 play with USC, losing 6-3 at home in 1984, winning 24-0 at home in 1985 and wining 32-25 at the Coliseum in 1991. DID YOU KNOW, PART TWO: Arizona State and USC were tied for eighth nationally according to U.S. News and World Report among the up-and-coming schools in the country. The ranking, based on peer nominations, recognizes institutions that have made the most promising and innovative changes in the areas of academics, faculty, student life, campus or facilities. UP NEXT: The Sun Devils will remain at home, hosting the Oregon State Beavers of the Pac-12 North Division on Saturday, October 1. New College's Perla Vargas devotes her talents and knowledge to addressing issues including food allergies, oral health, asthma and obesity. It may be a cliché, but the expression “knowledge is power” has special meaning for Perla Vargas. The assistant professor of psychology in ASU’s New College of Interdisciplinary Arts and Sciences devotes her energy and expertise to empowering individuals, families and communities to acquire the knowledge they need to lead healthy lives. Research for the article included conducting focus groups with parents of food-allergic children to guide the development of a food allergy curriculum for newly diagnosed families. Vargas and her coauthors used the information they gathered to outline the basis for a comprehensive food allergy management curriculum for newly diagnosed families. This publication is just one of Vargas’ initiatives related to food allergies. She collaborates with the Phoenix Allergy Network, an educational food allergy support group for families. Vargas also serves as co-investigator for an educational supplement to the federally funded Consortium of Food Allergy Research (CoFAR), based at Mount Sinai Medical Center. Her work with collaborators on CoFAR’s Food Allergy Education Program has created Web-based resources that cover topics including basics for the newly diagnosed, managing food allergies inside and outside of the home, and fact sheets focusing on allergies to specific foods including eggs, peanuts and wheat. At ASU’s West campus, Vargas is committed to providing her students with opportunities to become involved in research projects; in fact, former student Maureen Keaveny is among the coauthors of “Developing a Food Allergy Curriculum for Parents.” Keaveny now is pursuing a doctoral degree in counseling psychology through ASU’s School of Letters and Sciences. When Vargas offered her the opportunity to work on research projects, Keaveny was particularly interested in food allergies because she and other members of her family have had to address this issue. She contributed to the project that resulted in the food allergy curriculum article. Another of Vargas’ former students is Michael Duhaime, who recently completed his bachelor’s degree in psychology from New College and now is pursuing a master’s degree in social work at ASU’s Downtown Phoenix campus. During his undergraduate studies, Duhaime participated in three projects with Vargas. One involved food allergies and the abilities of schools to respond to the health needs of children; another investigated the health profiles, lifestyles and risk-taking behaviors of college students; and a third involved collaborating with The Denton House, a local nonprofit community-based organization, to provide guidance on how the group can maximize its use of limited funding resources. Vargas earned her bachelor’s degree in Mexico; it was during her studies there that she became inspired to empower people to manage their own health. For those with limited access to health care, prevention is critical, she said. But Vargas said it’s also critical to understand that while socioeconomic status is a strong predictor of health, the reasons for this situation are not what we might guess. Vargas came to ASU in 2007 after working in the Department of Pediatrics at the University of Arkansas for Medical Sciences, where she was part of a team studying allergic diseases in children. Previously she earned her Ph.D. in psychology at the University of Arizona and completed a post-doctoral fellowship in the Department of Pulmonology and Critical Care Medicine at Johns Hopkins University. 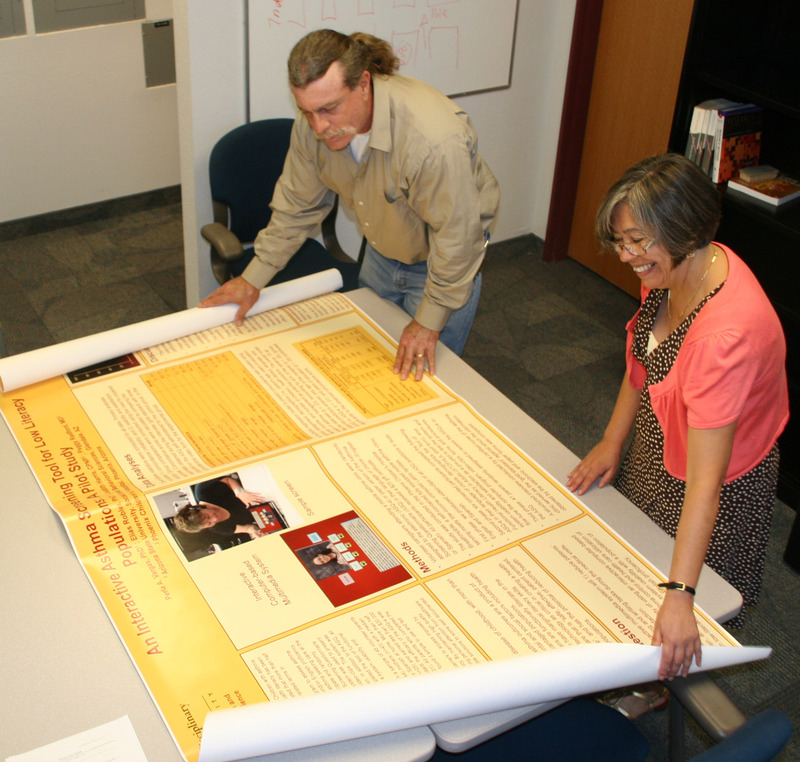 In her work at ASU, Vargas reaches out not only to a variety of community groups but also organizations within the university, such as the Family Communication Consortium and the Southwest Interdisciplinary Research Center. SIRC, an Arizona Board of Regents center supported by the National Institute on Minority Health and Health Disparities, conducts trans-disciplinary minority health and health disparities research. At SIRC, Vargas serves as co-director of the Research Education and Training Core on Health Disparities. Vargas’ research interests extend well beyond those related to food allergies. She also is interested in investigating behavioral processes involved in the management of children’s oral health, asthma and obesity, and in developing effective methods to improve management of these conditions and food allergies among high-risk, underserved children in community settings. “I want to learn about the critical factors necessary to change health protective behaviors and to develop behavioral interventions to improve people’s health status and quality of life,” she said. In other words, Vargas is employing that “knowledge is power” expression to make positive health changes at the grassroots level, in metropolitan Phoenix and beyond.